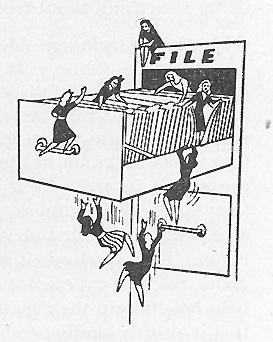 This record group consists of the YWCA's national administrative office files including the office of the General Secretary (later Executive Secretary, later Chief Executive Officer) records on buildings and properties owned by the national organization, finance and development files, and records of the departments of data and statistics, library and archives, and publicity. Forms part of the YWCA of the U.S.A. Records. NOTE: For the most part, the Microfilmed Records and the Original Format Records do not duplicate each other and both should be consulted. This description covers materials in both formats. See the Contents List for a folder-level inventory of the Original Format Records. See the Microfilmed Records Reel Lists for a detailed inventory of the microfilm. Links to the lists for both formats are provided in the Series Descriptions. This record group consists of the YWCA's national administrative office files including the office of the General Secretary (later Executive Secretary, later Chief Executive Officer) records on buildings and properties owned by the national organization, finance and development files, and records of the departments of data and statistics, library and archives, and publicity. This is the Contents List for the Original Format Records only. The reel lists for the Microfilmed Records are in a separate file. See Series Descriptions for historical and scope and content notes about this Series. Joseph Kamp, the Constitutional Educational League, and his pamphlet "Behind the Lace Curtains of the YWCA," 1948-56, n.d.
Rose Terlin, 1939, 1946-50, n.d.
World Federation of Democratic Youth, 1945-67, n.d.
New York State Membership Corporation Law, 1946-55, n.d.
Office charters and description, 1959-89, n.d.
Handbook: "For Those Who Write and Those Who Type," 1950, 1989, n.d.
General and history, 1946-72, n.d. Correspondence, memoranda, minutes, and agreements, 1973-99, n.d. Youth Development Program, 1997-2001, n.d.
Corporate identity and new logo, Bass/Yager & Associates, 1986-90, n.d.
Baker, Gwendolyn Calvert, 1988-93, n.d.
General, 1980-82, 1990, 1996, n.d.
Pamphlets and brochures, 1983-97, n.d.
General and history, 1911-82, n.d. Drawing of the interior, n.d.
National Board residence (135 East 52nd Street), 1943-82, n.d.
General information pamphlets, 1933-90, n.d.
International Building Fund, 1987-96, n.d. Personal and family, 1921, n.d.
Finance Management Workshop, YWCA Leadership Training Institute, n.d.
Community Associations, 1913, 1963-97, n.d.
Executive Management for Women, 1975-76, n.d. Tribute to Women in International Industry (TWIN), 1978-92, n.d.
Campaign budget and plan, 1995-98, n.d.
Community Counseling Service Co., Inc. Gifts: policies and procedures, 1996-98, n.d. Teen Pregnancy Prevention, 1997, n.d.
General and History, circa 1921-2002, n.d.
Statistics, miscellaneous, circa 1941-94, n.d. Integrated Management Information System "YWNet, YW Link"
General and history, 1986-99, n.d. Leadership Development Center Library, 1981-83, n.d.
YWCA historical publications collection, 1984, n.d.
World YWCA Archives, 1943-89, n.d.
General and miscellaneous, 1968-94, n.d.
General and miscellaneous, 1982-97, n.d.
Dissertations and theses re the YWCA, 1997, n.d.
600 Lexington Ave. "Reminiscences Collection II"
Oral History (various), 1966-89, n.d.
National Endowment for the Humanities grant: "A New Resource for Scholars: the YWCA Archives"
YWCA of the City of New York, 1975-2001, n.d.
President portraits gallery (proposed), 1988-94, n.d.
Christmas, "Hanging of the Greens"
YWCA "Fact Sheets," 1977-2000, n.d.
Brochures and pamphlets, circa 1910-2001, n.d.